The Sun, The Daily Mail, The Times, I didn't read them this morning, but I hope that Andy Murray read them all. Worst case, I hope his mother/sometimes coach Judy has copies of all the British dailies stashed away so that he can read all the writers who spent years lambasting him suddenly singing a new tune (if only for a day). I hope Andy Murray pulls out of the Rogers Cup with "fatigue" in the form of a lager drenched headache and a long, long night of partying with his mates and an afterparty with Kim Sears. Professional tennis is a grind like none other in sport: solitary, crisscrossing five continents, playing tournaments from New Year's Eve to Thanksgiving, with every week's results dissected, overanalyzed and recounted by the press corps, fans and coaches alike, not to mention a ranking system that tells you every single week of the year where you stand in relation to your competition. Murray was considered, for lack of a better phrase, the most accomplished "non-winner" the game has ever known. Having forever rewritten his narrative with his win over Roger Federer for Olympic gold yesterday, I sincerely hope the Scot is indulging in the sweet taste of victory. I imagine somewhere in an appropriately posh quarter of Central London last night, that Ivan Lendl sat in a corner, dour as ever, with a jumprope and stopwatch in hand, irritated by all the noise, checking his watch over a training session that never happened...as it should have been. It speaks volumes of the dominance of the ATP Big Three that the No. 4 (who has been ranked as high as second in the world) winning the Olympic final registers as more than a mild upset. Murray's record versus Federer coming into the day at 8-8 more than suggested that he could beat the World No. 1, but conventional wisdom (and history) countered that on the biggest stages, where the game's history is made, he just couldn't. He wasn't even with Federer to the big match followers, he was a decided underdog, 8.5-1 said noted UK bookmaker William Hill, bookies farther from the crown likely said worse. Murray wouldn't win on a stage this big; he never has, why now? If this were Cincinnati, different story, but the Olympics? In the UK? At Wimbledon?!? Nope, precious few truly expected a win, let alone a straight sets drubbing that made the World No. 1 and 17-time major champion look as shockingly ordinary as his fellow silver medalist and Career Grand Slammer, Maria Sharapova looked a day earlier against Serena Williams. 6-2, 6-1, 6-4?!?! Against Federer? This was obviously some Murray fanboy joke perpetuated across the internet, not a real match score. Just a month earlier, Murray reached the Wimbledon final, his fourth in a major and he lost. The best most could say afterward was that unlike in his first three major finals, at least he win a set this time. He actually started that match well, very well, blasting winners and matching Federer at every turn. Then Mother Nature herself reset the balance. Rain came, forcing the final under the roof, eliminating the elements and lifting Federer in his favored conditions to a seventh Wimbledon crown in the last ten events played. Not that his other rivals have been less stingy vis a vis sharing the wealth. He's 5-13 against Nadal, and just 2-6 in majors. He's 6-8 versus Djokovic who took the Scot out of the last two Australian Opens in the final and semifinal respectively. This was the Ballad of Andy Murray, every triumphant note negated by the downbeat refrain, "Never beat 'em when it counts, can't cash the check and drown 'em out." 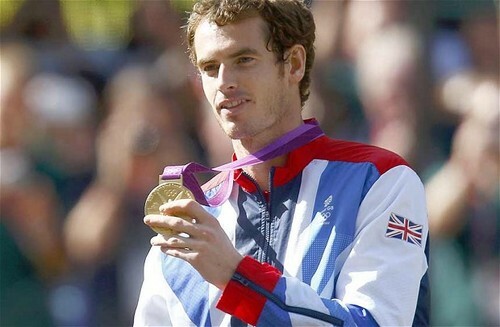 At the most unlikely of venues, Wimbledon Centre Court it happened, Andy Murray won the biggest tournament of his life. With not just the British press watching, but the entire world; against the greatest champion tennis has ever known, Andy Murray came good. So if it takes Andy a week or so to pick up a racquet again, we're ready to cut him a little slack. In fact, we would applaud him. It's been a long road to glory for Andy Murray, we hope he can enjoy the destination just a bit before moving on. Well said my friend. Lovely read, but I think he should go to Toronto and start shooting for No. 1. When you're hot you should stay hot, right? Normally I'd agree, but there's something to be said for enjoying the spoils of a hard-fought victory before taking on the next challenge. Otherwise...2012 Nole? Select a ideal dimension based on your requirements. fake breitling The majority of the totes are made of canvas, 100 % cotton, polypropylene as well as leather-based that makes it long-lasting. Carriers can be found in various designs, dimensions, designs and styles. replica chanel Using the introduction associated with e-commerce web sites, you can now purchase carriers on the internet. fake chanel You are able to select from manufacturers such as Kanvas Katha, End up being With regard to Tote, The home associated with Tara, Greenobag, Caprese, Energetic Components, Snoogg, Fastrack, Thoroughly clean Earth, Jute Sapling, Atrangee, Shilpkart, Chumbak, Wildcraft, Environmentally friendly part, JG shoppe, Abqa and so forth. fake louis vuitton Buying carrier totes on the internet is simple, secure as well as handy. louis vuitton replica Store in the comfort and ease of your house and obtain the merchandise sent to your own doorway action.